It should come as no surprise to you that these days that kitchen stainless steel appliances are by far the most popular for kitchens. Check out our data chart and table below for precise figures. Of course there are pros and cons to stainless steel kitchen appliances. It wasn’t all that long ago in the big scheme of things that stainless steel was considered an upgrade. These days, it’s standard. 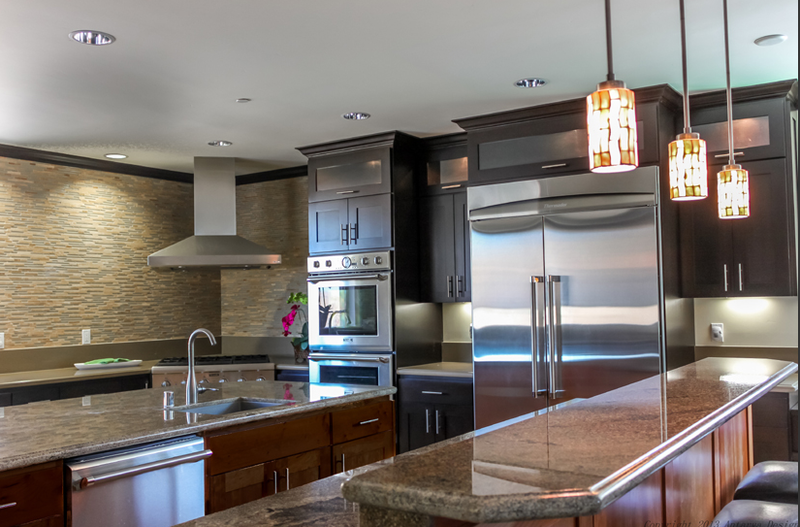 Yes, stainless steel costs a bit more than non-stainless steel appliances; however, because it’s so widespread, it can hardly be considered a premium appliance option. 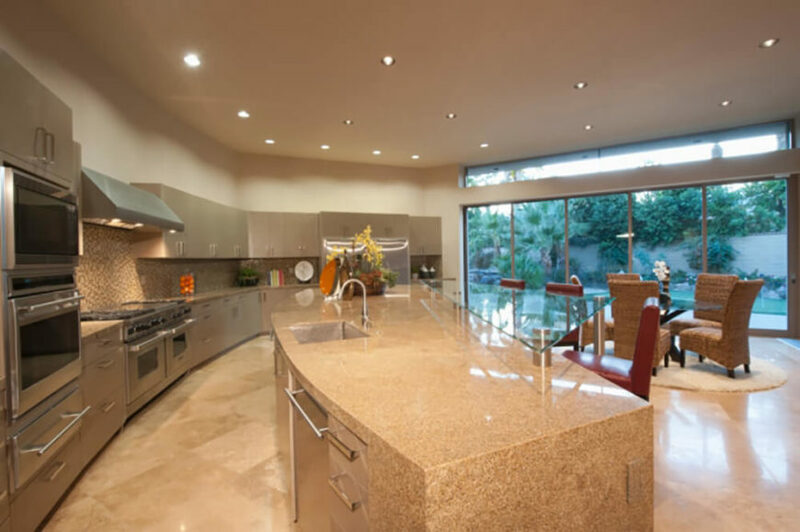 This post showcases over 1,000 kitchen designs with stainless steel appliances. We add more every week. 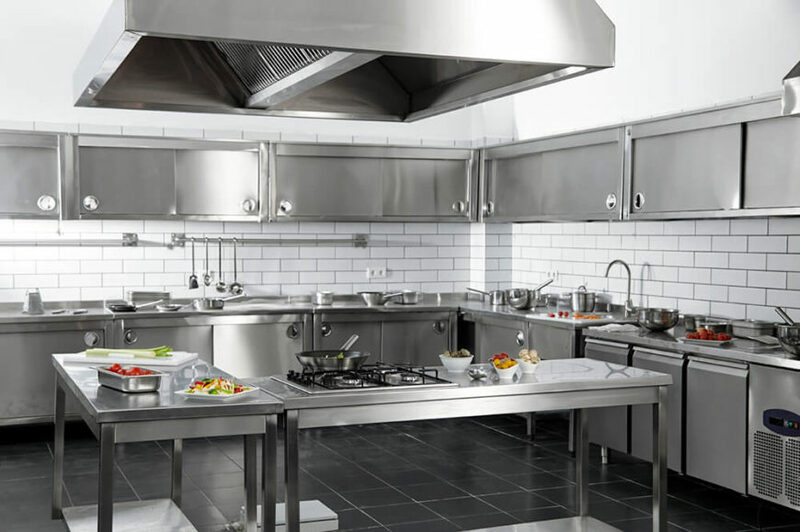 Frankly, stainless steel works with any kitchen color, features, cabinet finish, island design, countertop, backsplash, kitchen lighting, faucets and style. That’s what is cool about this style of appliance. 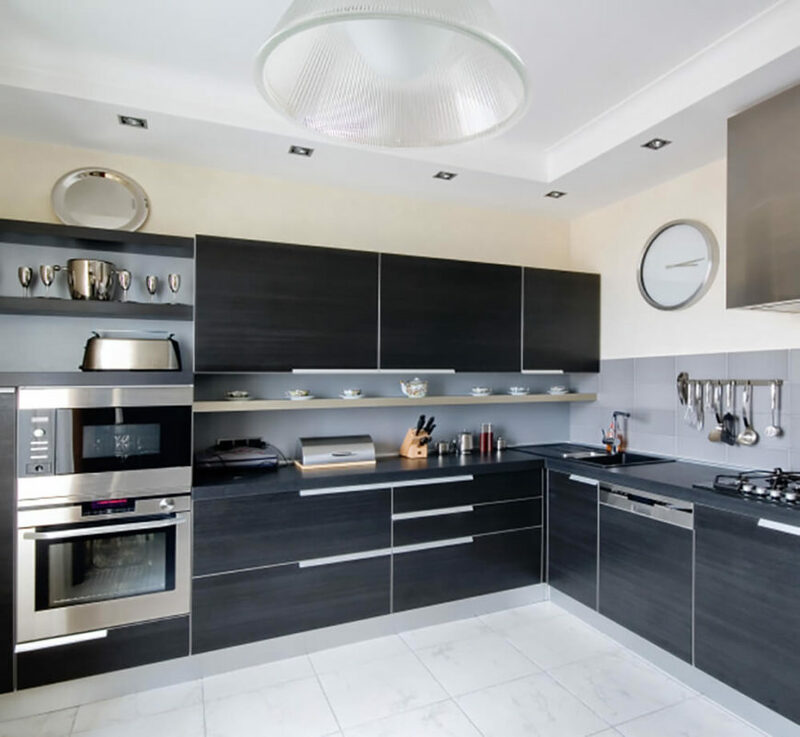 While our gallery focuses on the main appliances such oven, stove, refrigerator and dishwasher, you can also get most smaller appliances such as coffee makers, toasters, toaster ovens and microwaves to name a few in stainless steel. Below is our massive gallery. When a kitchen is deemed to have stainless steel appliances, it means the main appliances have a stainless steel finish or casing. These include oven, stove, refrigerator and dishwasher. How popular is stainless steel? 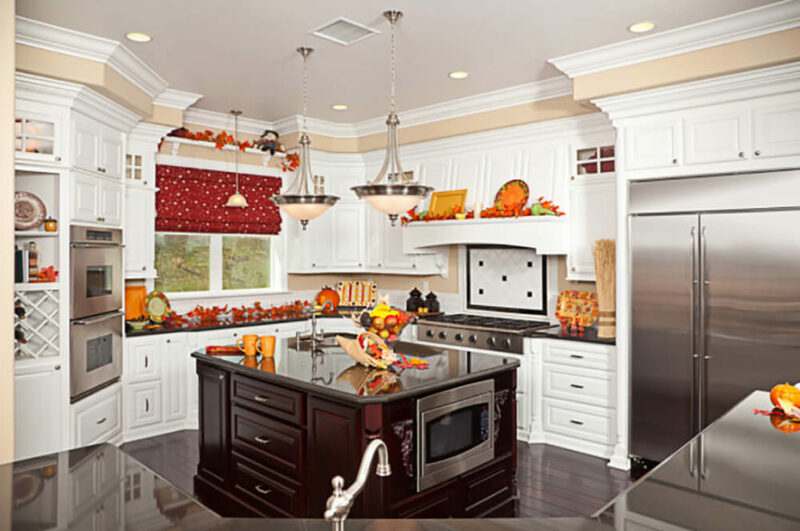 Recently, a real estate agent contributed to an article titled “Top 10 Kitchen Upgrades for Home Sellers“. 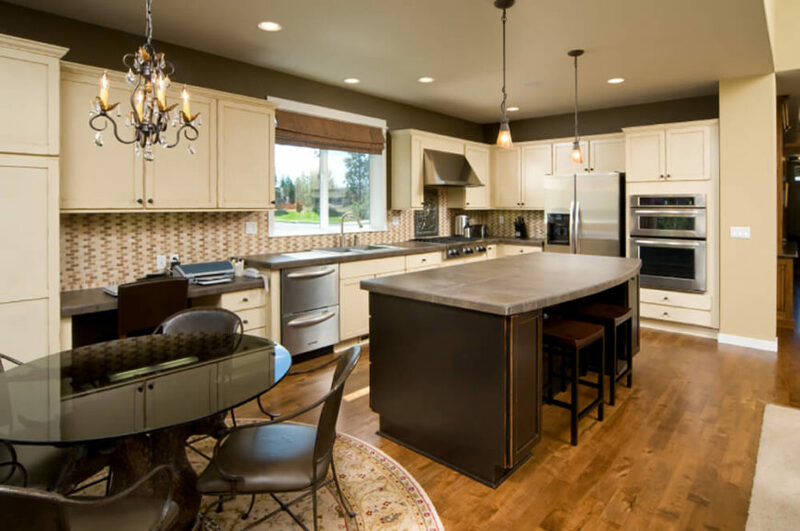 This article focuses on which kitchen upgrades help with netting a higher price for your home and/or selling your home faster. It was his professional opinion that stainless steel appliances are definitely worth installing in your home just for resale value and saleability of your home. What about those nasty smudges and fingerprints? Smudges and fingerprints was the main reason my mom never wanted stainless steel appliances. With us kids in the house touching everything with our filthy hands, she knew she’d be wiping down appliances day and night. However, smudges and fingerprints are a problem of the past. Now you can buy smudge and fingerprint proof stainless steel appliances. That’s pretty cool, isn’t it? 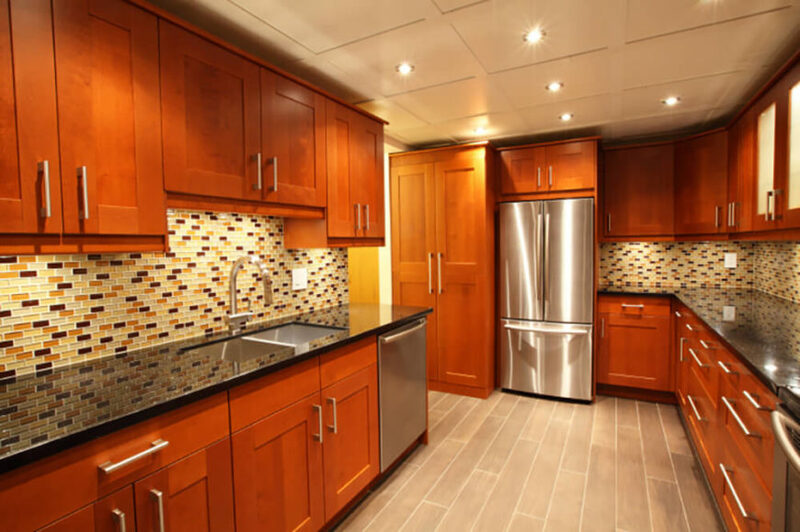 How much does a full fleet of stainless steel appliances cost? 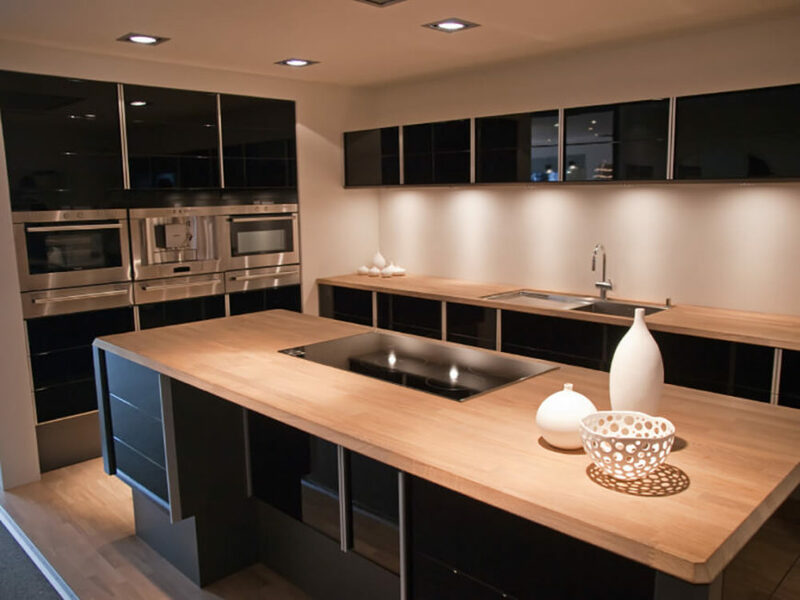 The range is huge because there are some very high end appliances, especially ovens and stoves. However, you can get a decent brand for a full fleet (fridge, oven/stove and dishwasher) for $2,500 to $3,500. When you go high end the costs can climb to astronomical amounts… even approaching $10,000. The sleek, glossy black cabinetry in this kitchen provides a bold counterpoint to the soft tones of rich natural wood countertops and hardwood flooring. The stainless steel appliances pair naturally with this look, adding an extra layer of freshness. The highly textural tile backsplash of this kitchen adds an attention grabbing layer to this contemporary kitchen, sandwiched between layers of light hued cabinetry over a hardwood floor. 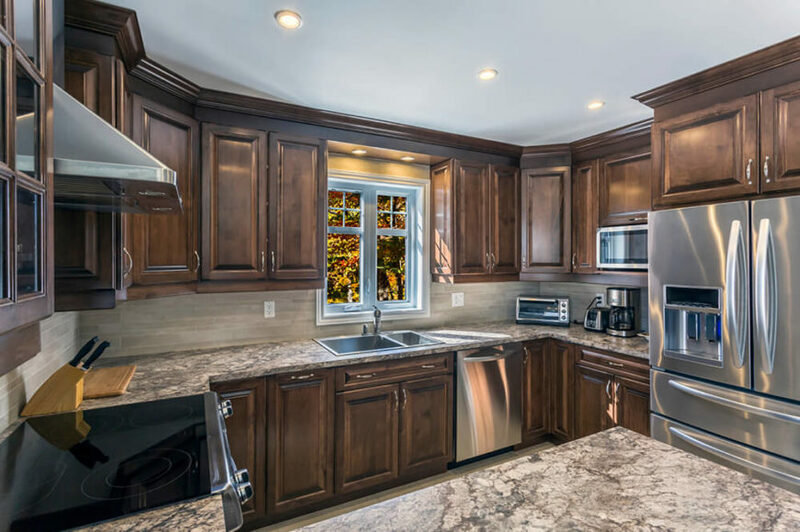 The massive island features a light brown countertop and dark stained wood body, in sharp contrast to the bright stainless steel appliances. 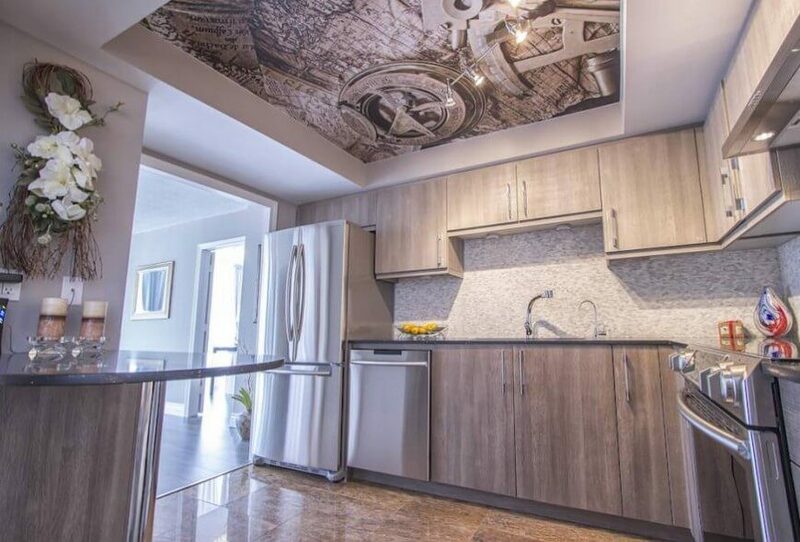 Beneath a bold art print on the ceiling of this kitchen, we see light grey stained wood cabinetry, a micro tile backsplash, and rich marble flooring. The sheen of stainless steel accents the space well. See more of this home here. Designed by CEILTRIM Inc. The contemporary shape of the rich wood cabinetry meshes perfectly with stainless steel appliances and a deep black quartz countertop. Light hardwood plank flooring, along with micro tile backsplash, adds a further layer of detail. 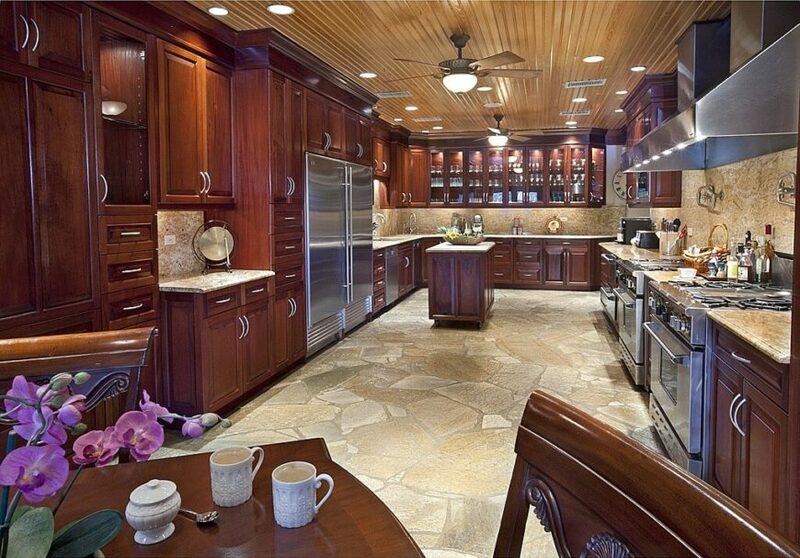 This vast kitchen features acres of rich wood cabinetry, plus marble countertops and backsplash over a stone floor. The ceiling features sleek wood planks and the intricate lighting scheme highlights the array of stainless steel appliances throughout. 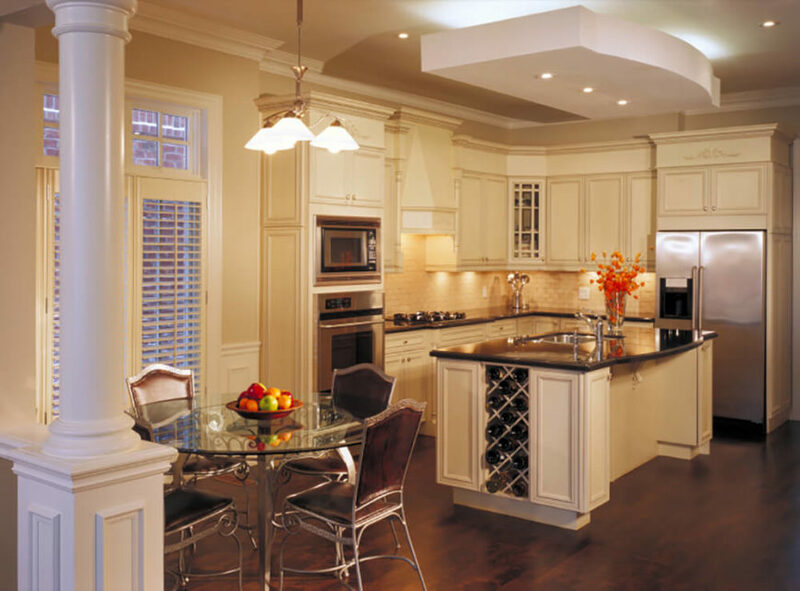 A large island centers this kitchen over dark hardwood flooring, with a sleek black countertop and built-in wine rack. Stainless steel appliances add a bold contrast to the off-white cabinetry all around. 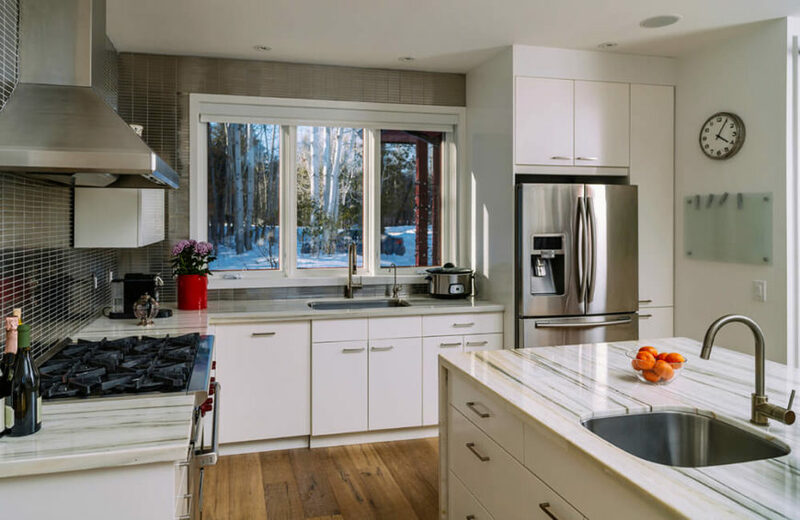 Bright and open design informs this kitchen, flush with white cabinetry and stainless steel appliances. The intricate tile backsplash adds a layer of complexity to the light room, helping diffuse the contrast with the black countertops. We love the large, stately island in this kitchen, topped with light granite and sporting both a large sink and plenty of space for in-kitchen dining. The stainless steel appliances add a sleek counterpoint to the soft tones of the room. 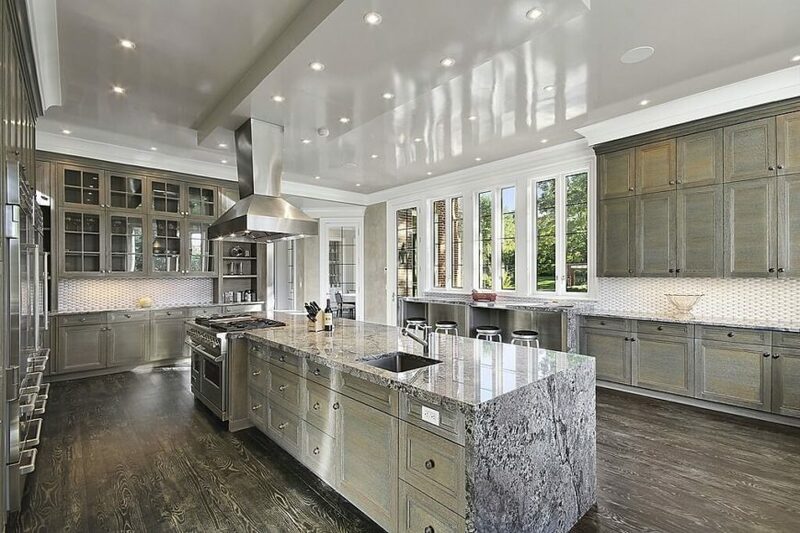 The massive, lengthy island covered in marble is the centerpiece of this vast kitchen, standing atop dark hardwood flooring and surrounded by rustic tinted cabinetry. The stainless steel appliances add a layer of sheen to the look without distracting from the overall style. This kitchen features a strong balance between various modern elements, from the glossy brown flooring to the sleek grey cabinetry. Stainless steel is a major factor here, informing both the appliances and a large slab-like countertop on the raised island for in-kitchen dining. 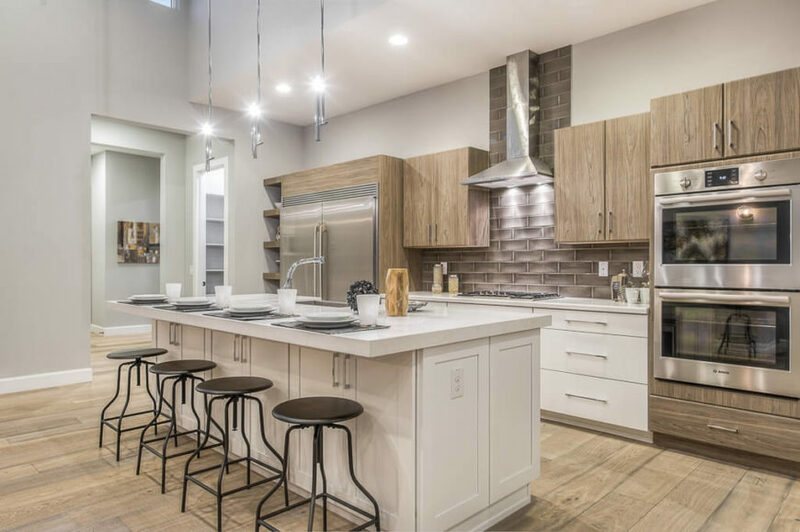 A series of pendant lights hang above the rich natural wood flooring of this kitchen, spiked with sleek white cabinetry and a two-tier island that provides plenty of dining space for a quartet of bar stools. 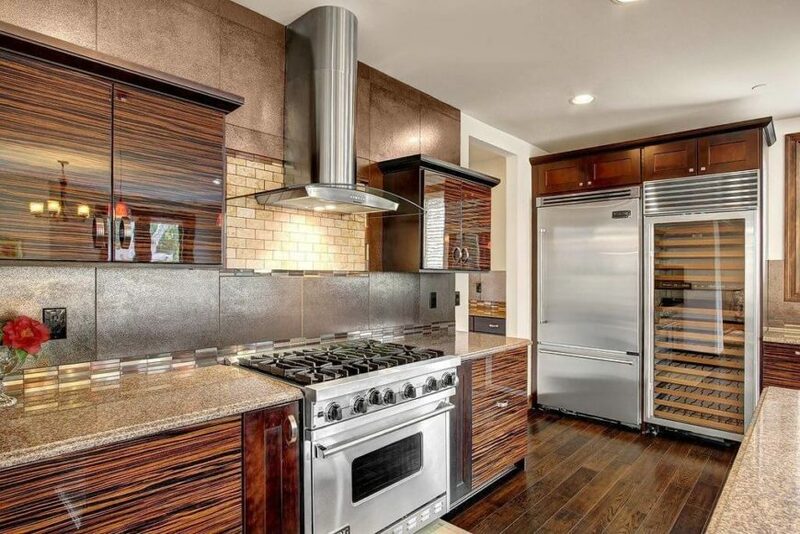 The stainless steel appliances make for a delicate contrast in this example. Here’s an enormous open plan kitchen design, lit naturally through a row of full height windows. 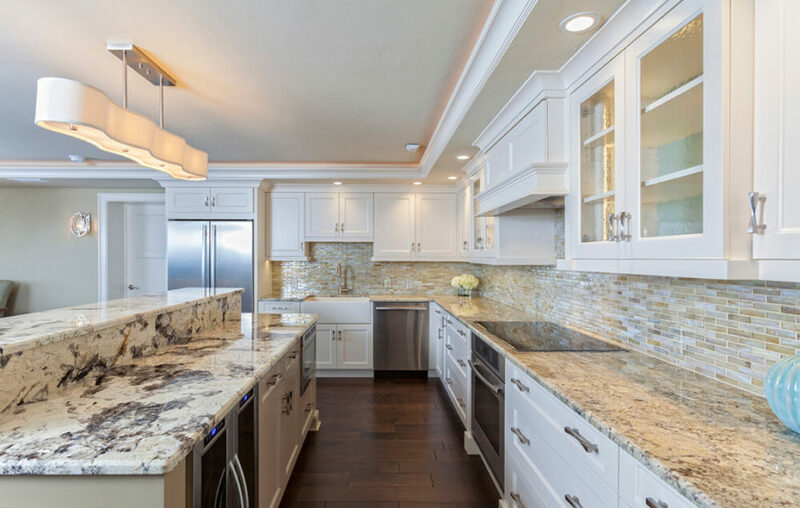 The giant granite wrapped island at center defines the space, in contrast with both sleek grey cabinetry and stainless steel appliances dotting the space. We love a solid contrast, and this cozy kitchen provides it in spades. 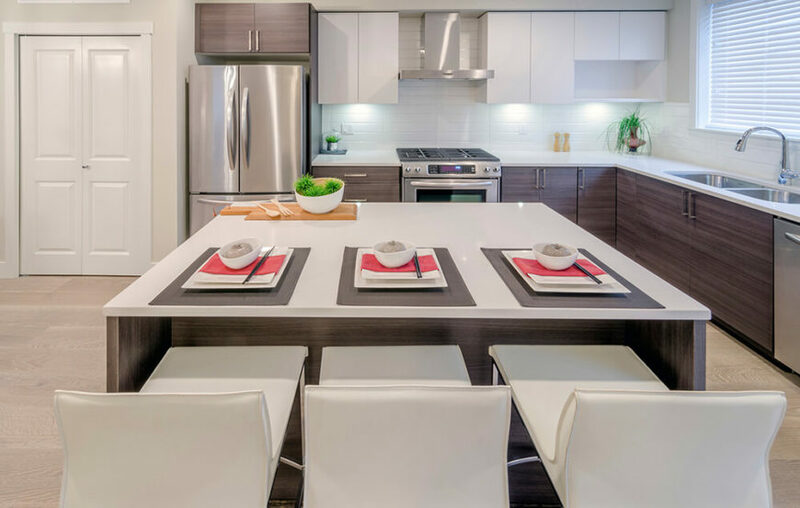 Rich wood cabinetry pairs with white marble countertops and large stainless steel appliances for a bold mixture and striking appearance. The warmly traditional look of this kitchen is slightly offset by the appearance of stainless steel appliances, adding a flash of the modern. The dark wood island at center features a built-in microwave, storage, and sink, offering utility and a visual anchor to the room. Bright, open design informs this modern kitchen, centered on a large white island with an extended countertop for dining space. A set of carved wood bar stools act as a rustic counterpoint to the contemporary look of stainless steel appliances and cupboard doors. See more of this home here. Designed by DOS Architects. Stark black cabinetry and stainless steel appliances mesh for a sleek look in this thoroughly contemporary kitchen. Large format marble tile flooring and a grey backsplash keep the neutral tone. 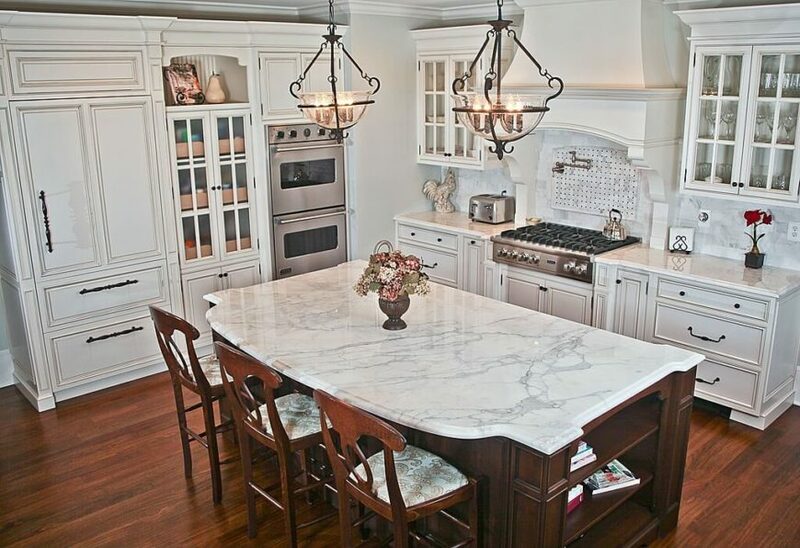 In a more traditionally styled kitchen, we see a massive marble topped, dark wood island at center, surrounded by ornate white cabinetry over a rich hardwood floor. The appearance of stainless steel appliances offers a subtle contrast. 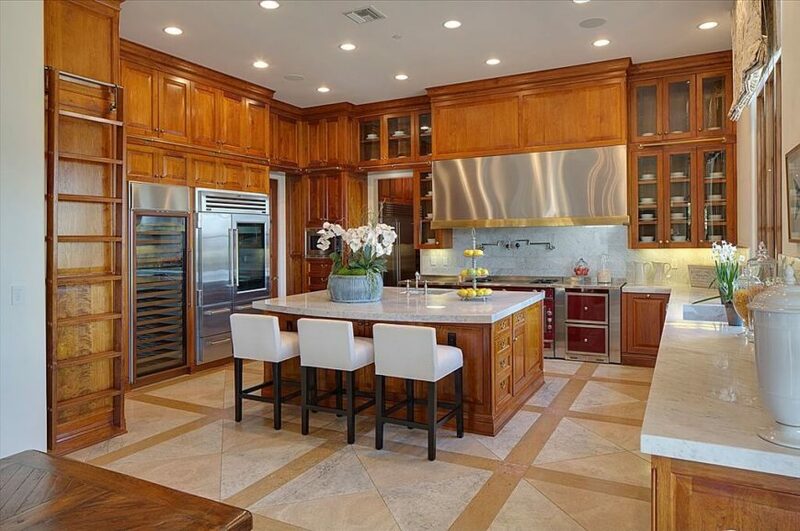 Rich, dark stained hardwood flooring contrasts with pristine white cabinetry in this large, open design kitchen. Stainless steel appliances add a flash of sleek modernism, but the whole room is anchored by the dark wood island with marble countertop. As part of a much larger open space, the kitchen here is defined by its stainless steel appliances. A set of black cabinetry contrasts with white walls and rustic storage bins below. See more of this home here. Designed by Jam Kolektyw. With a marble topped, two-tier island defining the edge of this kitchen, the stainless steel appliances help it stand out amid a large open plan home. 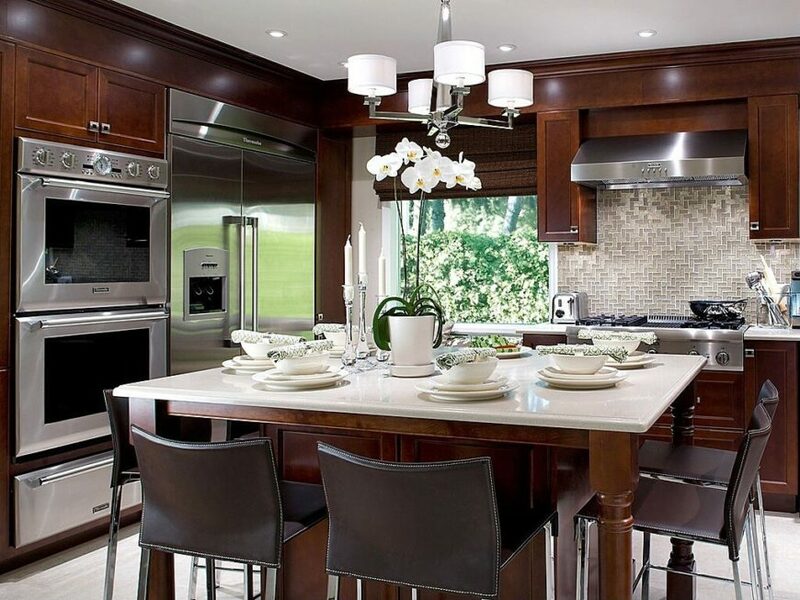 Subtle tile backsplash complements the vast array of white cabinetry with steel hardware. 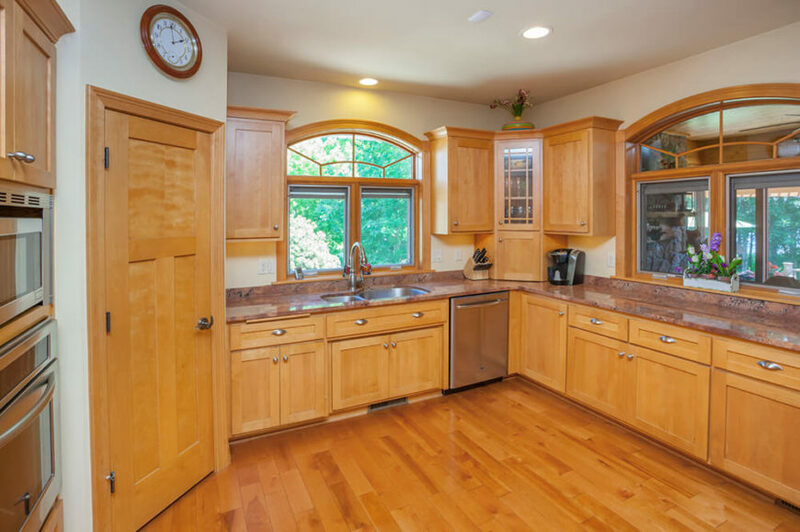 With a very tall ceiling, there’s plenty of room for an abundance of warm wood cabinetry. The kitchen even features a ladder and rail system, much like a library, for reaching the upper cabinets. In addition to white marble, the space is spiked by the appearance of stainless steel appliances. Ultra modern minimalism informs this sleek kitchen, pairing white countertops, tile backsplash, and upper cabinets with rich wood lower cupboards and island. The stainless steel appliances add a small dose of contrast. 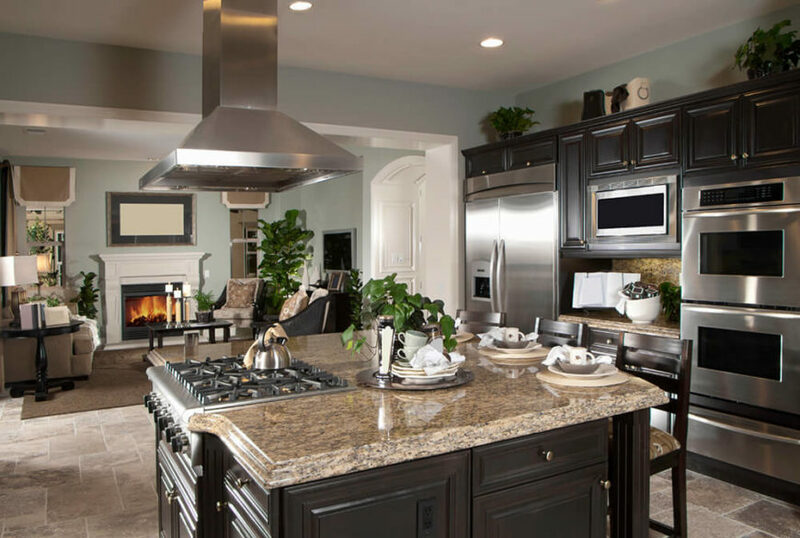 The first thing that stands out in this traditionally styled kitchen is the sleek appearance of stainless steel appliances, contrasting with the dark wood cabinetry. A massive textural backsplash at left adds fresh detail, while granite countertops mesh perfectly. Elegant color combinations paint this kitchen with a timeless appeal, from light granite countertops to the dark stained ornate wood cabinetry. Stainless steel adds a layer of modernity, while the stone tile floor anchors it in the past. We love the sleek texture of the wood cabinetry in this kitchen, adding a glossy sheen to a space dominated by the contrast between natural wood and stainless steel. The countertops and backsplash provide an abundance of textural detail as well. Sharp white cabinetry meets a micro-tile backsplash in this highly detailed, cozy kitchen. 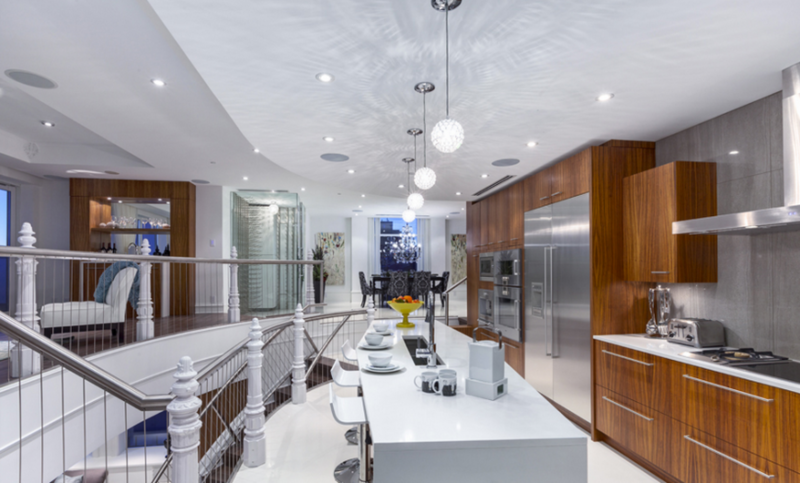 The island is wrapped in smooth marble, contrasting with the rustic hardwood flooring. Stainless steel appliances add yet another layer of contrast, making for a surprisingly cohesive whole. 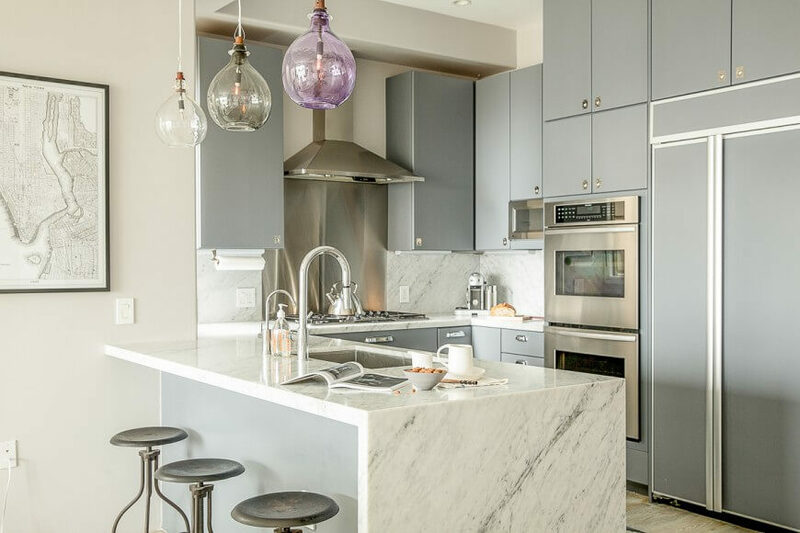 This cozy but open kitchen is defined by the pairing of sleek grey cabinetry and white marble countertops. The appearance of stainless steel appliances subtly matches the flush hardware on the cupboard doors. 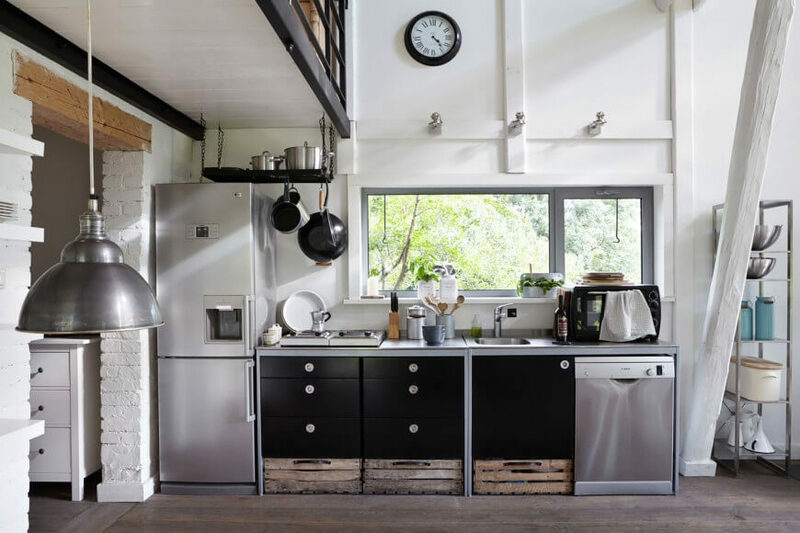 Here’s another fine example of the bold contrast and modernity that stainless steel appliances can inject into a traditionally styled kitchen. 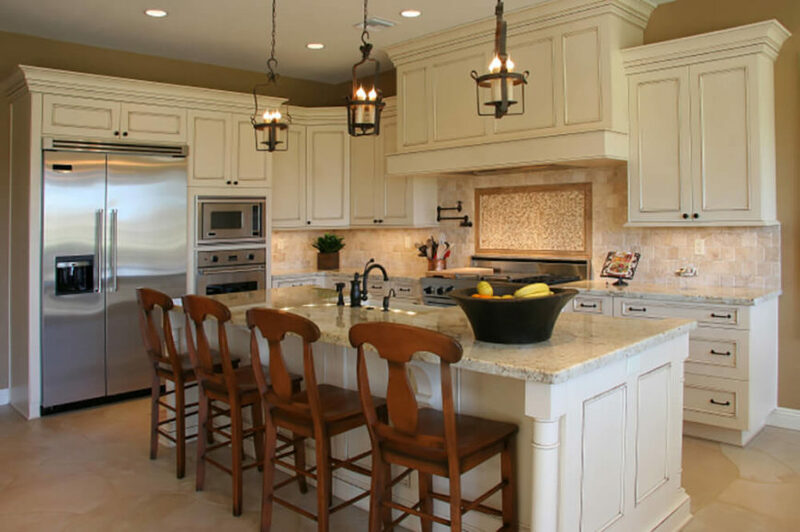 The granite countertops and stone tile backsplash convey a neutral tone across the center. It’s refreshing to see natural wood used to such striking effect in a thoroughly contemporary setting. This kitchen pairs the timeless material with white lower cupboards and countertops as well as stainless steel appliances. 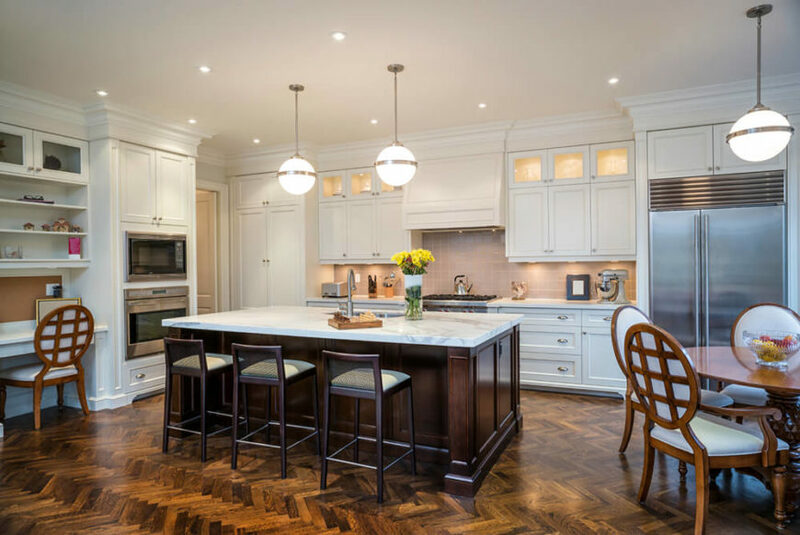 Warm light wood cabinetry matches the hardwood flooring in this large, open plan kitchen, contrasting with white walls and a blushing granite countertop. The subtle appearance of stainless steel appliances grants a bit of variety to the space without hogging visual attention. 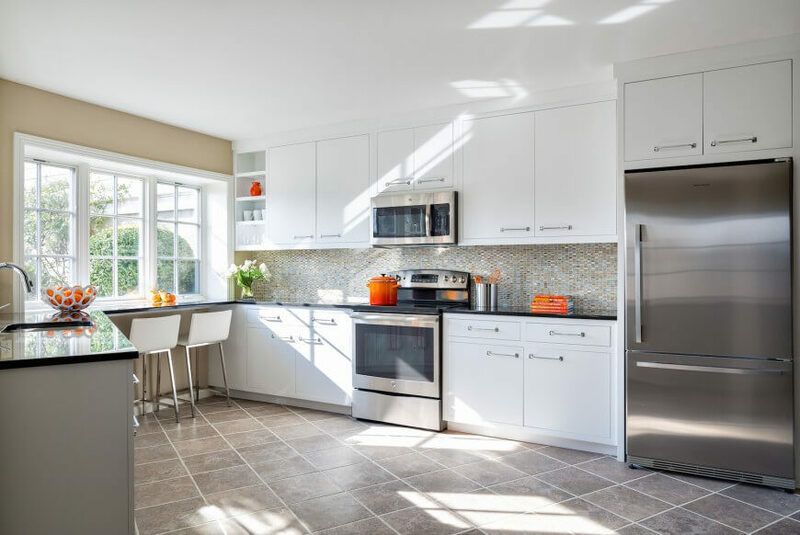 This kitchen is an absolute riot of color and texture, with bright natural wood cabinetry holding stainless steel appliances at right, and a pristine white island at center. Within a larger open design area, the kitchen is defined by this high contrast look. See more of this home here. Designed by Ben Amzaleg. 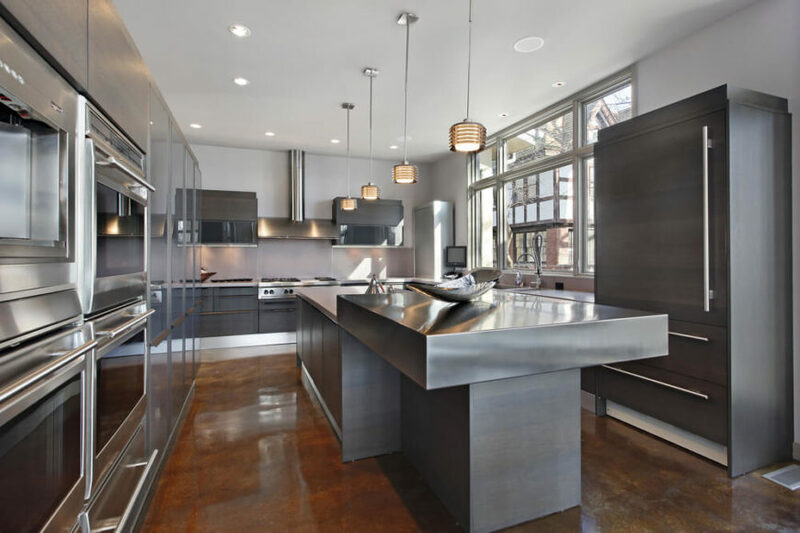 Stainless steel utterly defines this large, industrial styled kitchen. With rows of steel cabinetry and work tables, it’s a high tech look within a black and white tiled space. 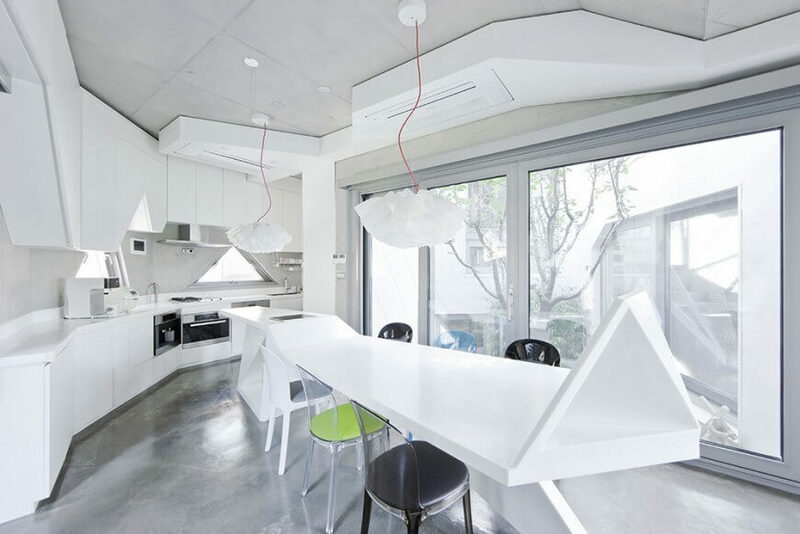 Our final kitchen is an astonishing modern creation focused on irregular geometric shapes. 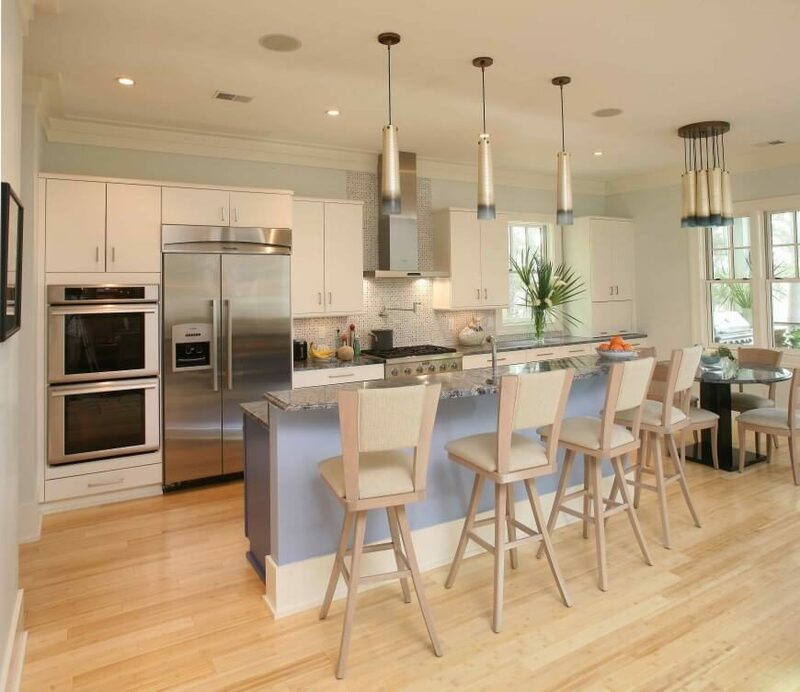 Bold white colors the island, countertops, and cabinetry while soft grey informs the flooring. Bright natural light pours in through massive full height windows, reflecting off the subtly powerful stainless steel appliances. See more of this home here. Designed by IROJE KHM Architects.